Marsala. You've probably never heard of this particular color, but all we can say is WOW; it's the most breathtaking color. It's no surprise that Pantone has chosen it as the 2015 Color of the Year. Think ripe cranberries or a deep red wine color. It's a sensual color for sure and it makes you feel important. It's really a color for anyone trying to be bold and make a statement in a deep and thoughtful way. It's such a strong color that we don't recommend going over board with it. For example, choose a Marsala lip stick and pair it with a light colored top and bottoms. Marsala color nails would be fabulous as it isn't super bold like apple red, but it's still sophisticated. Try pairing Marsala with black like this fedora from Windsor. The two colors compliment each other very well. 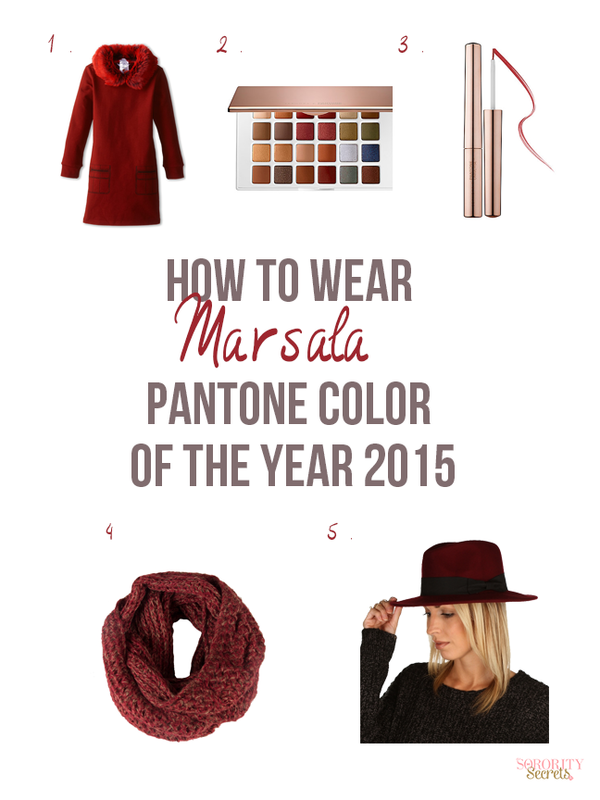 Marsala is a transformation color; you will feel like someone new when you're wearing it, so wear it with confidence! Yes, we are among the giddy people who anxiously await Pantone's Color Of The Year announcement, which is emerald for 2013. But, equally exciting, is seeing the creations made by the Sephora + Pantone Universe each year. As you may know, the two companies collaborate on a makeup collection annually, in honor of the chosen color. We weren't sure what to expect for emerald makeup...emerald lipstick?! Instead, Sephora has created a beautiful collection of vivid eye makeup, as well as nail polish and makeup tools-- and we love it! Definitely chic, and perfect for 2013. TSS It Girl, Alyx, tried out the makeup brush set in the collection. The verdict? TSS approved... plus, brushes in a pretty color do seem to make everything more fun! Excited to meet the rest of our It Girls, and learn more about Alyx from University of Colorado Boulder? Our big It Girl announcement is coming later this week, and we can't wait to share it with you!